Frederick Arthur Maguire was born at Cobar on 28 March 1888, son of George Frederick Maguire (died 4 November 1930) and his wife Martha (d.1944), née Smith. He was married three times and had a child of each marriage – a son named Robert from his first marriage and a daughter named Alma from his second marriage. In 1913 at Glebe he married Alma M Dive. Details of his other marriage are unknown. In December 1951 he married Dr Mabel McElhone, a Sydney gynaecologist with whom he was working on cancer research; she was the elder daughter of former Lord Mayor Arthur McElhone. Maguire died suddenly at his Darling Point home on 10 June 1953, aged 65, survived by his third wife and two children. The funeral was held at St Mark’s Church of England, Darling Point. Frederick Maguire trained as a teacher and taught at Sydney Grammar School. In 1911, he graduated with Honours in Medicine at the University of Sydney. He served as Resident Medical Officer at the Royal Prince Alfred Hospital and was a gynaecological consultant at other hospitals. He was Deputy Director of the NSW Medical Service before becoming Professor of Anatomy at the University of Sydney in 1920-22 and 1924-25. Maguire gave distinguished service in both World Wars. As Lieutenant-Colonel, he commanded the Ninth Australian Field Ambulance in World War I and was Director-General of the Australian Army Medical Services in 1941 and 1942. He was a member of the National Health and Medical Research Council, was on the NSW Council of the BMA, and was for many years Chairman of the Sydney Branch of the Royal College of Obstetricians and Gynaecologists. He was Fellow of both the English and Australian Royal College of Surgeons. He lived at Wirrulda, Redmyre Road, Strathfield, and later in Ocean Street, Woollahra. Dr Maguire was a Director of the Benevolent Society of NSW, the Royal Prince Alfred Hospital, and Honorary Surgeon to the Governor-General, Lord Gowrie, 1935-40. He was associated with the work of the St John Ambulance Society and the Red Cross Society. He was president of the Constitutional Association in 1927 and 1930. 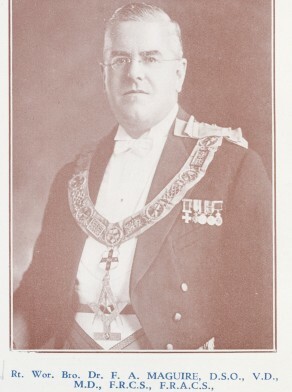 Maguire was initiated as a member of the Masonic Lodge of Australia No 3 in 1920 and was elected Grand Master of the United Grand Lodge of Freemasons from 1933 to 1935 when he retained the title of Pro Grand master. He was on the Board of Management of the NSW Masonic Hospital. Major General Maguire was awarded the DSO in World War II. His other decorations included the Companion of the Most Distinguished Order of St Michael and St George. In 1937 he was appointed an Officer of the Order of St John of Jerusalem. Frederick Arthur Maguire was elected Alderman for Macquarie Ward, 4 December 1948 to 1 December 1950. He was a member of the Works Committee and the Health and Recreations Committee from 1949 to 1950.